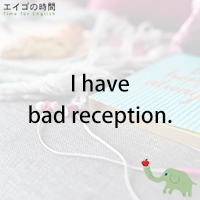 Now, what does “poor” or “bad” reception mean? Well, take out your phone and look at the home screen. At the top-left corner, you’ll see five bars or dots. Then it means you have good reception. When you see only one or two bars or dots, you have poor or bad reception. Instead of bars or dots, the “No Service” message may appear. Then you’re getting no reception. I have bad reception here.